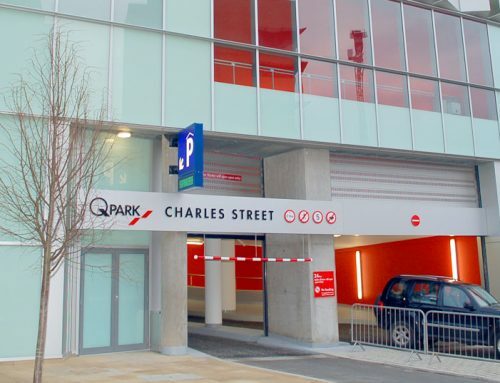 300m² of multi storey car parking. Hollowcore flooring units used in showroom office areas supported by steel Delta Beams to give a flush soffit. 3D modelling ensured potential clashes of M&E services with the structure was avoided and that accuracy of connections was achieved. Onsite construction completed in 18 weeks with the maximum number of PCE personnel on site being 16. This gave a saving of 14 weeks compared to other equivalent frame solutions. The 15,468m2 structure forms the new flagship Volkswagen sales and service centre in the UK. It is a suspended four-storey facility with a service centre at ground floor, showroom at first and second floors, offices, as well as 7300m² of car parking over four suspended levels. 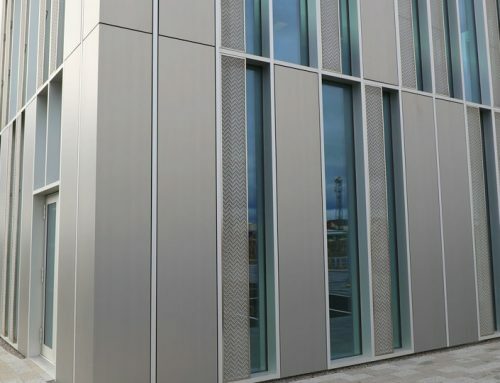 The project was constructed within an 18 week on-site programme, giving a 14 week saving over an in-situ concrete solution. The structure was erected using an LR1130 and an LR1160 crawler crane, part of the crane fleet owned by PCE Ltd. 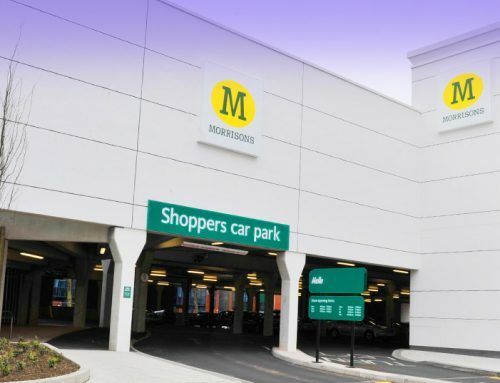 The use of 3D modelling during the design process assisted in ensuring that the potential clash of structure with M&E services was avoided, as well as helping to determine the accuracy of connections and developing logistics and erection programmes. 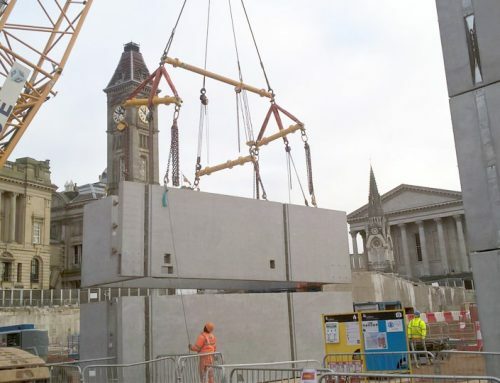 Over 1500 precast concrete components, some weighing in excess of 20 tonnes, were manufactured in six different off-site precast concrete factories. Just-in-time delivery was co-ordinated to ensure a fast on-site construction programme was maintained. 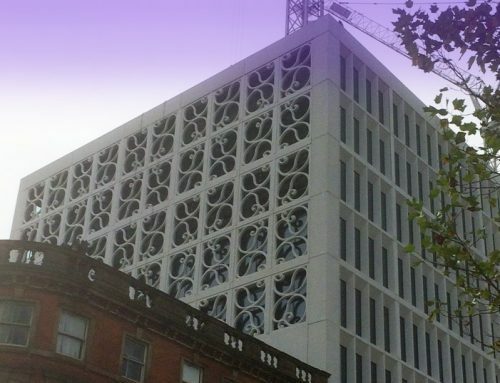 Off-site construction of concrete frames is not new to PCE. The company has developed control systems to ensure that the functionality of its design processes flows through component manufacturing to ensure optimum on-site construction, with the safety of all personnel being of paramount importance. Most of the elevated showroom and car service areas do not have exposed concrete finishes, thus hollowcore flooring units were used with an in-situ structural concrete topping, supported by a precast frame (including Deltabeams) to ensure minimal downstands. This ensured the ease of running M&E services and maximised ceiling-to-floor heights. To ensure visual attractiveness, the architect also specified circular columns cast in white concrete in the car showroom areas; these were easily accommodated within the design-and-build process. 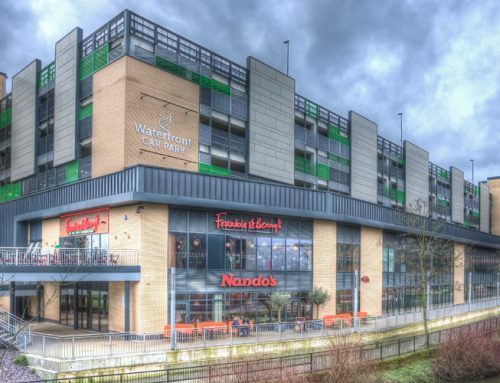 The three stair and lift shafts that provide structural stability to the finished structure used a precast concrete box solution, rather than individual panels, enabling full height construction of these shafts including stairs and landings to be achieved in less than eight days. Nickie Brown, Managing Director of PCE Ltd.